Golf fans who watched the recent Arnold Palmer Invitational at Bay Hill were reminded of Orlando’s status as a bastion of the game: home to The King and numerous present-day pros, not to mention a huge assortment of quality courses. Site of the annual PGA Merchandise Show, Orlando has thus also provided an ongoing source of subject matter for this reporter. In addition to perhaps a half-dozen features about golf, accommodations, and dining options in and around Orlando, I’ve also made it a point to play different courses during two decade’s worth of visits to the show. So I felt somewhat akin to a fool to “discover” Bella Collina following this year’s installment of the show. Situated some 20 minutes west of downtown Orlando – the skyline’s visible from the higher elevations at the club – maybe Bella Collina’s seemingly low profile is partly the result of the aforementioned profusion of area golf tracks. The hunch here is that the recession is probably also part of the equation, visibility-wise, as Bella Collina is both a private club and a still-developing upscale residential community. Hence, the golf course is open to outside play at certain times, a magnet to prospective members and homeowners. Packages include play-and-dine combinations featuring the club’s excellent dining alternatives. In any event, sandwiched between Lake Siena and Lake Apopka on 1,900 acres, the place proved a pleasant surprise on multiple fronts. First, its proximity to Orlando notwithstanding, Monteverde, the town where Bella Collina is actually located, and neighboring Clermont exude “Old Florida” appeal: low density, mostly unspoiled indigenous flora and fauna. At the same time, the rolling topography is decidedly un-Florida-like. 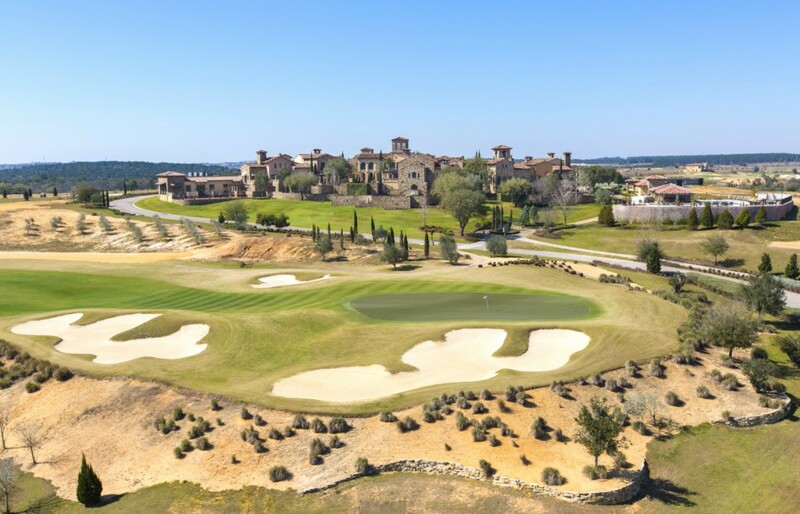 Then there’s the themed aspect – Bella Collina’s tag line is “The Spirit of Tuscany” – which I feared might resemble an unaffiliated extension of nearby Disneyland. Not so. The 75,000-square-foot clubhouse and outbuildings — designed by Marsh & Associates, whose portfolio includes clubhouse projects at The Bridges and Pronghorn – is tastefully handled, not hokey, right down to the non-native Italian cypress tree landscaping. Finally, the Nick Faldo-designed golf course was a treat, and not just as a February reprieve from winter in New England. With only a handful of courses in North America, Sir Nick’s design style seems indeterminate (I’ve played a couple of others in Vietnam), but the layout at Bella Collina is a good resort test. Landing areas are generous, with many of the six sets of tees taking advantage of the site’s elevation, which tops out at 180 feet above sea level. On the challenge side of the ledger, the terrain entails plenty of sidehill lies, as well as frequent strong winds. There’s copious bunkering, including some cavernous greenside examples, although most putting surfaces have run-up alleys, and the well-conditioned greens’ contours are seldom severe. The course plays just more than 7,500 yards from the back tees, and the routing traverses some dune-like ridges and ducks between groves of orange trees and live oaks, providing ample variety. It’s a thinking man’s course, which is to say, I played pretty well. And amenities like a stunning infinity pool and a welcoming 19th hole may prompt you to want to stay at Bella Collina longer. Or even a lot longer, in which case it’s worth noting that custom home sites are priced starting in the $200Ks, custom homes in the $700Ks.